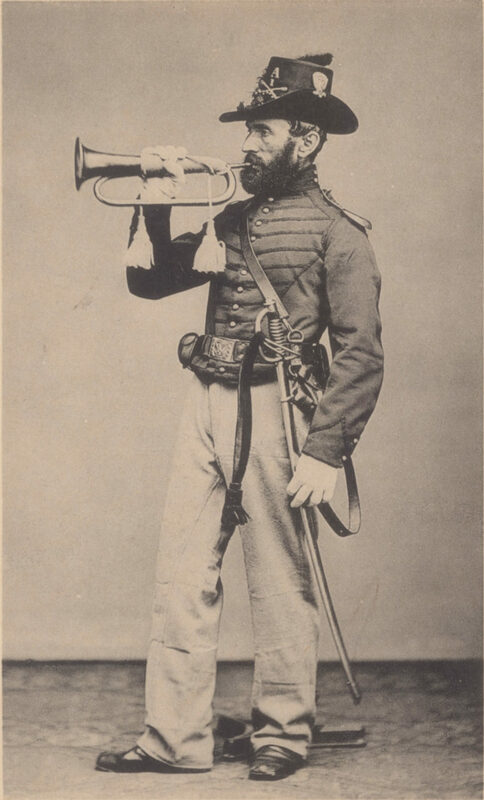 The uniform of the musician varies almost as greatly as that of the infantry. 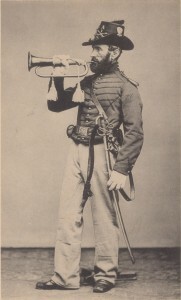 Brass bands were ornately uniformed with laced frocks, white gloves, and plumed, decorated shakos. Field musicians wore frock coats, sack coats, shell jackets, forage caps, and civilian hats and coats. The uniform of the musician, as per regulations, was “the same for enlisted men of their respective corps, with the addition of a facing of lace 3/8 of an inch wide on the front of the coat or jacket, made in the following manner: bars of 3/8 of an inch worsted lace placed on a line with each button 6 1/2 inches wide at the bottom and thence gradually expanding upward to the last button, continuing from the waist up, and contracting from thence to the buttons of the collar where it will be 6 1/2 inches wide with a strip of the same lacing following the bars at their outer extremity-the whole presenting something of what is called the herring bone form, the color of the lace facing to correspond with the color of the trimming of the corps.” In other words, a bird cage pattern of blue lace for infantry, red for artillery, or yellow for cavalry on the front of the coat. Musicians were issued swords like that of the NCO sword, but 4 inches shorted,and without the guard at the top of the hilt. However, many field bands did not follow this regulation. 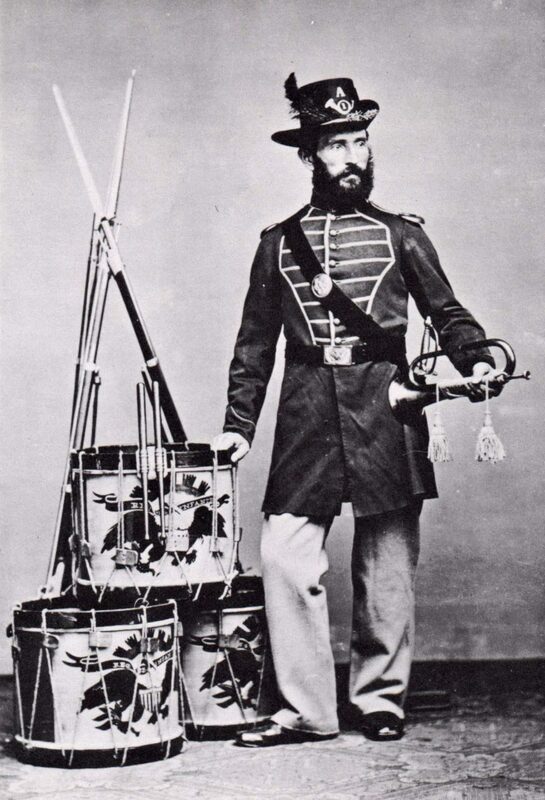 Photos show that bands were a mish-mash, just as infantry, with sacks, frocks without the facing, shells, and civilian garb intermingled. Band members wore both issued forage caps and civilian hats. Some opted not to carry swords.